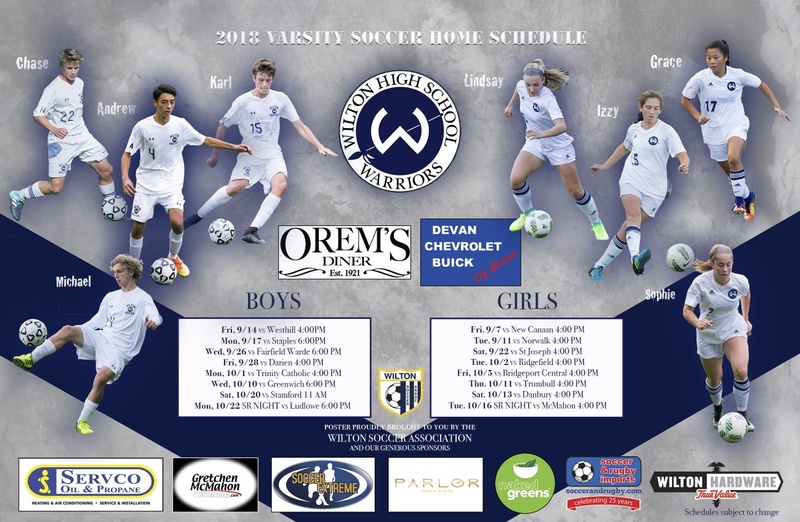 All WSA players will receive an 11x17 poster featuring the the dates / times of all varsity home games. The poster highlights WHS varsity captains and is brought to you by a group of local businesses that have committed their dollars and brands to making this poster possible. Thank you to Orem’s Diner, Devan Chevrolet Buick of Wilton, Wilton Hardware, Servco, Naked Greens, Soccer Extreme, Wilton Soccer & Rugby, Parlor Pizza (coming soon!) and Gretchen McMahon Photography for their support! Please in turn support their businesses. Display the poster prominently at home, bring it to games for player autographs, come to as many games as you can and please support our great local business sponsors. Team managers and coaches will be distributing posters to all players this week. WSA players will have the opportunity to serve as ball boys and girls for varsity home games. Slots will be filled on a first come first serve basis with specific games allocated to specific age groups/teams. Signupgenius coming soon! We would like to encourage the entire WSA community to come out for selected games during the season. We will send notifications in advance to rally the troops! We plan to organize at least one boys and one girls K-2 clinic where the varsity players will support our coaches and the WSA players during the sessions. We hope our youngest players can get to know and learn from our most accomplished!